In the latest post on my series about C# 6’s features, I want to look at nameof expressions. There are times when you need the string value of variables or methods or classes in your code. That could be to return an argument exception, it could be to have some sort of property changed notification, or it could even be to get the string value of an enumeration value. Previously, you had to either have “magic strings” in your application or any number of tricks to abstract away what are basically the magic strings. If you changed the name of a variable, parameter, method, class, or enum, nothing would ensure that you went back and updated your “magic strings”. Perhaps if you had written very finely-grained unit tests (and you remembered to update those when you changed a variable name), you might get a warning, but that is a tremendous amount of discipline. That’s where C# 6 is here to save our bacon. You can see how I could change the parameter name from foo to something else and the compiler won’t care if I fix the call to ArgumentNullException() or not. However, nameof fixes and prevents that. You actually will get a compile time error that says “The name ‘foo’ does not exist in the current context”. Some people hate using the compiler as a unit test, but I don’t. It is basically “round one” of testing. I think the issue arises when it is the the only means of testing used, but it is just another tool in the toolbox that we should use. As I said at the beginning of this series, much of C# 6’s features aren’t mind-blowing, but instead are small improvements to help smooth out some edges. Are you using nameof? Are you going to when you get the chance? 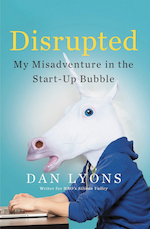 I recently finished reading a book by Dan Lyons called Disrupted: My Misadventure in the Start-Up Bubble on the recommendation of my friend Dustin Rogers. This book is an inside look at a company called HubSpot that – according to Lyons – exhibits some of the worst and most stereotypical traits of Silicon Valley companies. In this episode, I review the book and talk about some of the things that drive me nuts about these kinds of companies.